After a guest fell through the floor, this repurposing project became something special. George Risius constructed a cabin atop an old camper frame. Construction projects are nothing new for George Risius. The 63-year-old has been a do-it-yourselfer for most of his life, so, after purchasing an old camper, he knew he had the tools and the know-how to make the refurbishing process a success. “I knew the little camper was in bad shape when I bought it,” he remembers. “So I figured I would just do some stuff to it to fix it up. However, when my girlfriend at the time opened the door and walked into it, she fell through the floor. (Literally.) Well, I knew I was going to have to do a lot more than just fix it up, so I tore it down to the frame and then got a really neat idea,” he says. 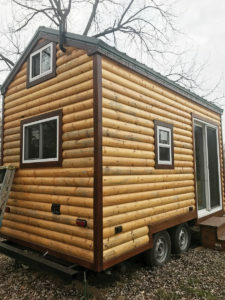 Enter the little cabin on wheels. There isn’t a lot of room in the little cabin, but Risius says it is efficient and will soon be livable.